The story starts with the small boy opening his front door one day and rather surprisingly finding a little penguin on his doorstep. He thinks that this is rather peculiar and decides that he really must find out whether anyone has lost the penguin so he can take him back! 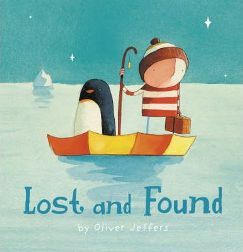 So he heads off to the Lost and Found office but soon discovers that no one has actually lost a penguin! Nobody could tell him where penguins come from either so he finally looks in a book and discovers that penguins come from the South Pole. Therefore, the little boy decides to take it upon himself to take the little penguin back to the South Pole so they set out in his small rowing boat. They meet all sorts of weather on the way but eventually they get there! Unfortunately, no other penguins are about so the little boy leaves his penguin all alone and rows away. As he is getting further away though he feels incredibly sad – and realises that maybe he has made a mistake and had better start rowing back so the penguin will not be lonely! When he gets there though there is no sign of his penguin who seems to have vanished! The boy is incredibly sad now as he sets off for home alone and is really missing the penguin until…he spots a small boat in the distance and as it gets nearer he realises it is the penguin looking for him! So at the end of the story the pair set off for home together thinking of all the wonderful things they will do together in the future! This is a really enjoyable book and the theme of friendship is incredibly strong. It goes to show how much everyone needs friends to share things with! It is told in a very simple way and it is particularly noticeable that neither the boy nor the penguin is actually given a name! The pictures that accompany the story are really vivid and beautiful particularly the ones showing the pair at sea. The colours of the sea change drastically with the differences in the weather and this really adds to the understanding of the story. Looking at the pictures as well as listening to the words really contributes to my daughter’s enjoyment! The font is very child friendly and almost looks like a young person’s handwriting. This will really help when children start to read the story for themselves! The language is also very straightforward as well so they don’t have any difficulty understanding the story. The book is published by Harper Collins and both my daughters and I really recommend it as it really is a heart warming story that definitely makes you appreciate your friends! No Comments on "Lost and Found"